Comment on Add Tropical Flavor To Sunday Brunch by zaxtor. I bought these five months ago. 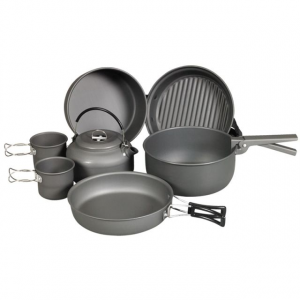 I spent hours and hours online shopping for a new set of pots and pans, reading hundreds of reviews, researching the benefits of hard adonizing over stainless steel and other aluminum products, and this was the set I finally chose. I couldn’t be happier! I looked at everything out there; from the cheapest to the most expensive professional cookware there is. I compared Pampered Chef, Paula Deen, Emeril, Cuisinart, Kitchenaid, Le Creuset…..and more. I checked them all out! My Criteria. Versatility – I’m single so for the most part I use the smaller pans in the set. Because of that it was important to me to find a set that had lids that fit the smaller skillets. Most sets out there have lids for the pots, but nothing for the skillets. But I also wanted larger pans for when I do entertain. Durability – I’ve spent way too much money in the past on pans that bend if you drop them, can’t stand up to high heat, or end up with non-stick that starts peeling off after a few uses. I was looking for durability. Non-Stick – I’m a cook, not a chef, and have never really like stainless steel, so it was weeded out of the selection choices early on. I do like cast iron and at first was dreamy eyed about very expensive enamel coated cast iron (Le Creuset), until several of the reviews reported their enamel was chipping into the food and they have had no luck collecting on the lifetime guarantee, and this stuff is expensive! Price – obviously I wanted the best bang for my buck. I’d have purchased a more expensive set if I thought the quality pay off was worth it.  So that was my criteria…..and this set fullfills it perfectly. Durability – Hard adonized – It is twice as strong as stainless steel, and a fraction of the weight. I haven’t dropped any on the floor yet, or taken a hammer to them, but they feel solid and have held up fantastic so far. The other choices didn’t seem so great. Any of the enamel sets (including Rachel Ray) reported chipping and peeling enamel, some just from being put in the dishwasher a couple of times. The cheaper non-stick coatings were peeling off, and I’ve already mentioned the issue with the enamel cast iron. The real test of the hard adonized will reveal itself with time. I’ve used them in high eat, stuck them in the oven, cooked rice, eggs, mac & cheese, and it all slides right off the non-stick coating and haven’t had even a scorch no matter how high the heat. I’m OCD about using the appropriate utensils for non-stick pans in order to avoid scratches or abrasions, but this non-stick coating is not the cheap crap that will eventually peel off. If you take care of it, it’s going to last a while. 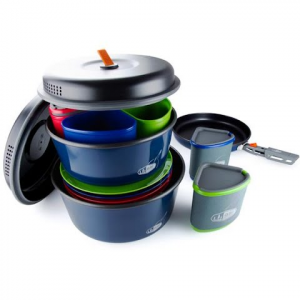 Versatility – The lids from the pots fit the skillets! It is So awesome to have a lid for every pan! No more using a tiny lid in a big pan to cook my basted eggs; no more having the edges of a bigger lid dripping condensation onto a burner…..a lid for every pan!! The one question I was asking myself as I unpacked it was “where the heck am I going to put these?” Well, all the pots nest nicely within each other, with a paper towel between them to protect the finish, and the same goes for the skillets. The lids actually take up more space, but also store easily in a couple of stacks next to the pans. So, there you have it. I’m really well-pleased with this cookware. I almost didn’t buy it at first because I didn’t want to get sucked into buying a set with a TV Chef’s name attached. But I really did the research and was convinced this was perfect for me, and so far, I have been spot on! Update: A few more months have gone by and I thought I should add a couple things. The set is still as great as my original review and I still love them. A warning about putting them in the dishwasher. I don’t know if it is recommended or not, but I thought I’d rather use the dishwasher even if it shortened the lifespan of the pans a bit. However, the soap residue did discolor the outside of the pan. I was able to scrub it off with an SOS pad, but then decided I love their color too much to run them through the dishwasher. They clean up so easily that it’s not a big deal. Also, someone commented about a cheap set that got burn marks on the bottom. These will get burn marks also. It’s pretty much my fault as I’ve poured grease out of the pan and then put it back on the burner, and the grease that dripped down the side burned. It came off with some scrubbing, but there is still a mark there. Regardless of these two issues, this set still is perfect for what I wanted and is performing in every way expected. Enjoy!